Because it lives and breathes in a way few artists can capture. It's full of incidental detail and crammed with… stuff that looks strange and mysterious but somehow also looks worn, lived in, but functional. You have no idea what half these things are supposed to do, but you have no doubt that they all do something. Can you recommend comics with his illustrations? Midnight Surfer and a bunch of one-offs he did throughout the eighties. Yup. Midnight Surfer is probably the standard against which all other depictions of MC-1 are judged, in my book. I'm a Kennedy MC1 man too. I'm not quite sure about his later potato-chinned wide-groined Dredd, but his MC1 is absolutely perfect. A shabby, lived-in, plastic-and-concrete nightmare. For me, Sunday Night Fever is pure, 100%, stone-cold MC1. The overwhelming scale brings home the utter inescapability of the place, and you can almost smell the piss and puke in the nooks and crannies where the homeless huddle together. Lovely. Y'know, there's so much which is simply great - in general Midnight Surfer is the magnus opus for a number of reasons, but I think my single favourite depiction by Cam of the Mega-City is from the Back on the Streets splash page. As ever, Barney is your friend - I doubt there's anything on that list that isn't great, though if I get a chance later I'll try to pick out the best of the best. There's also some nice street-level backgrounds in The Taxidermist where everything is believable and grotty. I prefer the more curvy Mega City stuff like Cam and Carlos (who is also one of my 'definitive' MC-1 artists). Gibson also did some really great depictions in his earlier stuff (Rumble in the Jungle, IIRC, has some mad-busy stuff) though his later MC-1's tend to be less crowded. Just a little rough and tumble, Judge man. Someone will be along with the Dredd case file volumes that you need, but in the meantime..
Batman/Dredd - Vendetta in Gotham. Admittedly, none of these will show you his Mega-City One, but you do need to see them! Case Files 30 will have Return of the Assassin in it, which is his best work on Dredd. But that'll probably be in December. 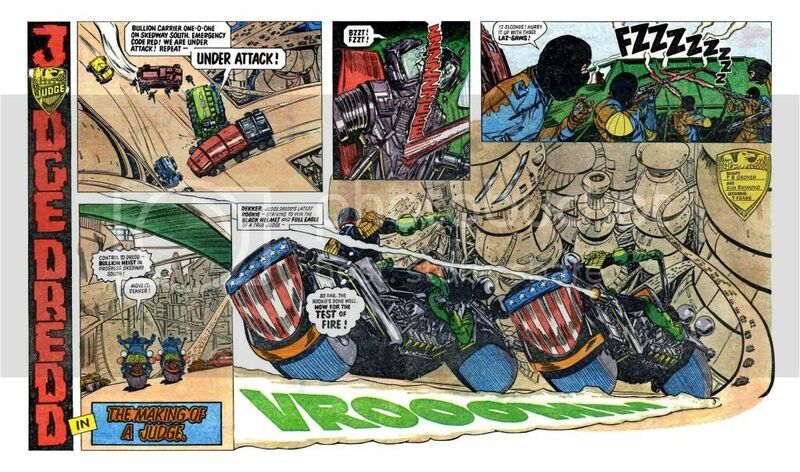 In the meantime, there is The Cam Kennedy Collection (which happens to contain a Dredd story which isn't in either the Case Files or the Restricted Files, for some reason). True - though Vendetta had a pretty good depiction of Gotham City (though I'm not particularly a Batfan, so can't compare to other depictions). Thanks Dog - that's precisely the picture I was thinking of (also appeared in the Judge Dredd Calendar last year, but in a really tiny thumbnail). Just realised the book I thought was called The Can Kennedy Collection is actually The Art of Kenny Who? I'm not so interested in his art style per se, just the depictions of MC-1. The architecture of the buildings, how the city looks from street level and from long distances, and the discordance between the filth and the lustrous part. glad to be of assistance . Take a look at the pic I posted above, it's a longshot of the city and, as I mentioned, there are some nice, grimy, street-level panels in The Taxidermist (also by Cam) as well as 'The Falucci Tape' from around the same era. As others have said, Midnight Surfer is like a whistle-stop tour of Cam Kennedy city scenes which, if you're able to get a look at, you'll see for yourself what we're on about. 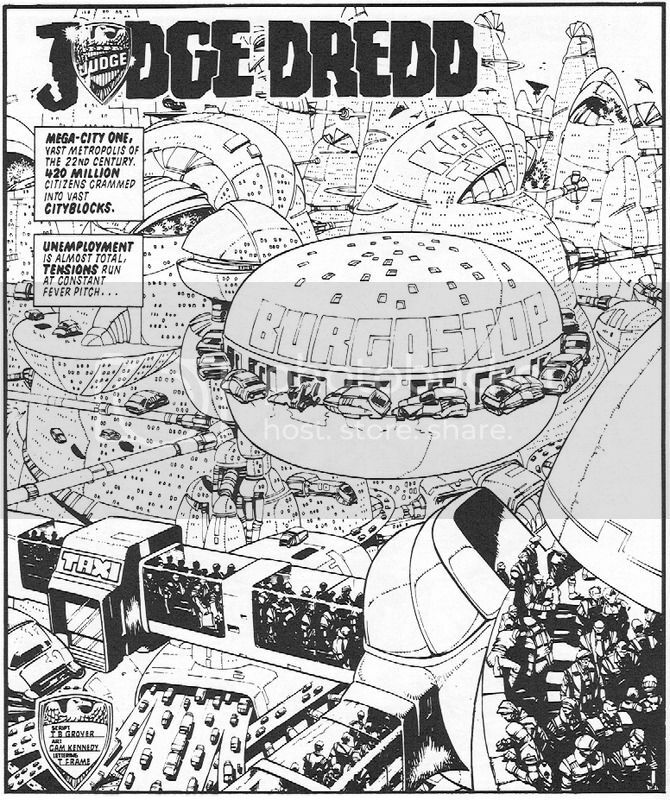 I'd also throw Carlos Ezquerra's cityscapes into the mix too- from distant, scratchy background stuff to full blown views of a weird and fantastical vision of the future, though I pretty much love anything drawn by Carlos. I also bought a Colin MacNeil page pretty much because of the cityscape and panel layout. Like all artwork- you pays your money, you takes your choice and one opinion is as valid as another. I'm a Cam Kennedy man too - no-one marries everyday squalor and hi-tech futurism to create spaces his people actually live in quite like he does - but from the modern era I'd suggest looking at Henry Flint's splash pages in Total War, and at his and and Colin MacNeill's big splash pages in Day of Chaos (if you can look past the carnage and smoke): they do a good job of showing individual spaces between and around blocks (under the corpses and fall-out clouds). Obligatory shout-out for Kim Raymond's insane swooping megways and skeds. Accidental extra "l" in MacNeil, my apologies. Is there actually a reason we don't have an edit window on certain sub-forums? Looking forward to reading the interview in this month's Megazine!